Céad míle fáilte to members of the Colleran family from England, America, France and all over Ireland who are gathering in the Drum area this weekend. Up to 150 members of the extended Colleran family are joining surviving members of the the original Colleran family from Curryore, Drum, including 89 year Tessie Naughton (nee Colleran), Doohan, Ballydangan and her 90 year old sister Breda Harty from Watford, London, and extended families. Important committee meeting will be held on Thursday 1st August at 8.30pm. All members please attend. Sadly, this week we way farewell to Fr. John McManus who on Friday next, 2nd August, will be taking up his duty as Parish Priest of Ballagh and will be living in Ballyleague. He replaces Fr Ray Browne who is now Bishop of Kerry. Fr. John has worked in the parish since September 2001 and was extremely hard working and dedicated as he made a major contribution to the spiritual life of the parish. Immensely popular, he will be sorely missed but he can be assured of the good wishes and blessings of all whose lives he enhanced by his ministry and preaching. 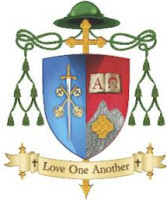 On Saturday next, 3rd August, we are happy to welcome the new Bishop of Kerry, Most Rev. Ray Browne, to Ss. Peter & Paul’s Church, Athlone where he will celebrate the Vigil Mass at 6.30pm and he will meet parishioners after Mass. Bishop Ray is the first bishop in Ireland to be appointed by Pope Francis. He can be assured of a warm welcome in the church where he received all the sacraments, from Baptism to Ordination to the priesthood. It is fitting the Bishop Ray’s Cost of Arms includes St. Peter’s key and St. Paul’s sword. Clonown: Sunday 11th August at 3pm. Cornamagh: Sunday 11th August at 4pm. Coosan Cemetery: Sunday 18th August at 4pm. The Clonown Gathering takes place on Sunday 11th August. There will be Mass in the cemetery at 3pm followed by a display of photographs and records in the community centre. The display includes school records, Tithe Allotment Records, Griffith’s Valuation etc. They have just completed a survey of the new graveyard (opened 1917) and have retrieved burial records relating to the old graveyard dating back to 1789, from the parish register and hope to display this information. There will also be light refreshments. They are hoping that people with Clonown connections will be interested in attending. Gala concert in Ss. Peter & Paul’s Church, Athlone on Friday 20th September with guest artist, Athlone soprano Bread O’Connor. Tickets €25 are now available at the Parish Office 090-6492171 or 086-0525661 or the Sacristy 090-6494150 or any member of the committee. Proceeds in aid of the Church Restoration Fund. Further details and updates available on the Facebook page.